This recipe requires a fair amount of chopping and dicing, but you're well rewarded at the end and... if it's totally not in the cards we plan to have a few of these in our grab-and-go cooler freshly made from time to time, so check us out. Lunch champions! Cook the rice noodles and rinse in cold water to cool completely before draining and dividing across four large salad bowls (or containers if you're making lunch ahead for a few days!). Peel and julienne your carrots and red pepper, thinly slice the cabbage, cut the green part of the onion on the diagonal and slice your cucumber. Arrange the veggies on top of the rice noodles as you chop. Top your colorful creation with a few sprigs of cilantro and a generous amount of chopped peanuts. To cook the shrimp, get a pot of water (about 8 cups) on to boil and add a tablespoon of coarse salt. Once the water is fully boiling, slide the shrimp in and give them a stir. It will take about two minutes for the water to return to a boil, and then boil for one minute more (three minutes total - if you're using larger shrimp this may take a bit longer, but be careful not to overcook). Rinse your shrimp in cold water to cool, then arrange them across the top of your four bowls. To make the dressing, very finely mince the garlic, ginger and jalapeño pepper and add to a small bowl. (I finely minced *and* used an immersion blender to really get the flavors incorporated.) Add the lime juice, honey, soy sauce, sesame oil and water, and stir well or blend to combine. This is a very flavorful dressing, but give it a taste to see if you might want to add a touch more honey - I think you can easily go up to 3 T honey if you like more sweetness. 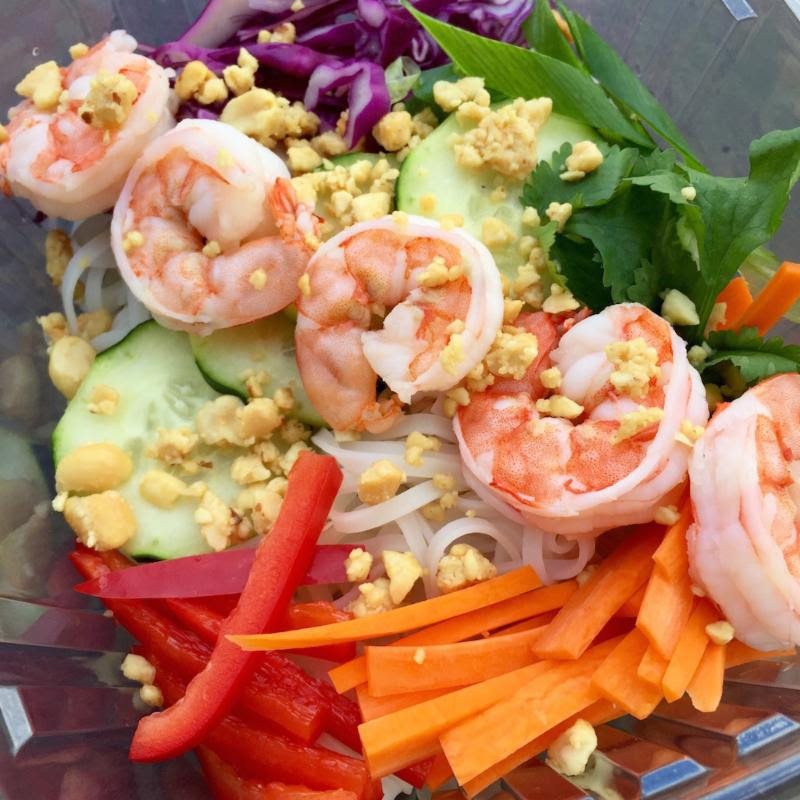 To serve immediately drizzle about 2 T of dressing over the top of each spring roll bowl. To serve at a later time, keep the dressing on the side and refrigerate up to four days. Enjoy!